AGE: Ripley is a handsome, 11-year-old Bernese Mountain mix who was surrendered because his owners could not take him with them when they moved. PERSONALITY: Ripley is a friendly, out-going boy who enjoys both play and cuddle time. He has lived with other dogs and cats, but is possessive about his food and treats. 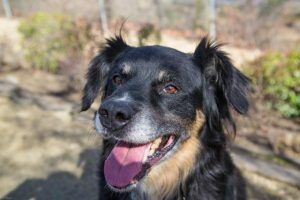 HIGHLIGHTS: Ripley takes treats gently, is house-trained and well-mannered … he would love to go home with you live out the rest of his golden years. COST: Ripley’s adoption fee is only $75, and includes a free one-hour in-home training and a wellness visit at a local veterinarian office. Ripley is neutered.